Insulating material for clothing and bedding often comes in the form of down, the soft feathers taken from geese and ducks. Despite a European ban on the live-plucking of feathers and down, harvesting feathers from live geese during the moulting period continues. Moulting occurs naturally in geese between 3-5 weeks, when the first fluffy down covering (natal down) is shed and then again between 8-11 weeks when the juvenile plumage is replaced by adult plumage. In adults, moulting occurs after the egg laying period in females and every 6-7 weeks in other non-laying geese. Plucking the feathers from geese when they are not moulting means that the live and healthy feathers are ripped out of the skin by force, causing bleeding follicles and possibly other damage to the skin such a tearing and bruising. Although studies have suggested that at the time of moulting “mature feathers are easy to remove (without any pain or skin injuries)”, the European Food and Safety Authority Panel on Animal Health and Welfare point out that “it seems that at least minor suffering from pain and injuries is unavoidable under current commercial conditions”. The suffering of geese in the harvesting of down has recently been highlighted in the response to a petition in the European Parliament. Replying to the petition which addressed the live plucking of geese in Hungary and Poland, even outside of the moulting period, the European Commission’s conclusion was less than satisfactory – the Commission said, “these Member States are responsible for taking actions to prevent such non compliances”, despite acknowledging that live-plucking is forbidden in the European Union, under Directive 98/58/EC. A parliamentary question following the petition pushed the Commission further, noting that “the number of cases of animal cruelty coming to light is constantly increasing (particularly in Hungary and Poland)”. 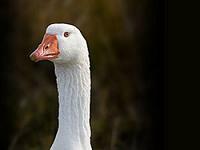 The Commission acknowledged the call for a ban on the practice of gathering feathers from live geese, but maintained that it would achieve progress on the issue by improving enforcement of the current EU legislation in the few member states concerned and by increasing awareness on this issue.